He was a stern-faced sniper — and a soft-hearted Marine who handed out candy to kids in Iraq. He was a warrior who wrote poetry about life and death. He was featured in Michael Moore's antiwar documentary, "Fahrenheit 9/11," portrayed as an overzealous Marine recruiter who targeted poor kids. But Staff Sgt. Raymond Plouhar was far more complicated than that. And it was that complicated man who died in Iraq in late June, as he served with some of the same men he had recruited years ago. It was that complex man who was buried Friday, by a family that honored his service but would never forget his humanity. "He had a huge heart," says his widow, Leigha. Plouhar was a Marine for 10 of his 30 years, but he had dreamed of joining the military ever since he was a little boy who liked to watch "M-A-S-H" on television and dress in fatigues and a camouflage shirt. He entered the Corps straight out of high school, was trained as a sniper and traveled the world — Bosnia, Sudan and Israel. He had a ramrod posture and a fierce pride in his appearance: He once ironed his uniform and polished its brass buttons for two hours before allowing his mom to photograph him. "He told me lots of times that he learned what could be accomplished... if you put your heart and soul in it — and he put his heart and soul in the Marine Corps," says his father, also named Raymond. "He was gung-ho from the time he signed his name until the day he died." His signature was a memorable one. His birth certificate read Raymond James Byron Anthony Charles Plouhar — he was named after all his grandfathers. He followed a long family tradition of military service that included a grandfather who earned a Purple Heart in World War II and an older sister, Toni, who was in the Army. Plouhar carried a Bible from his grandfather, Raymond, to Iraq. He kept it in his left shirt pocket next to his heart. Tucked inside was a photo of his wife and their two sons, Raymond, 9, and Michael, 5. As devoted as he was to the Marines, Plouhar had a full life outside the military. He liked to hunt and camp, take canoe trips and fish with his boys. He was known as a charmer, a good talker, a champion of the underdog (always defending and befriending kids picked on in school) and though he was trained to fight and kill, he preferred the role of peacemaker. "He didn't like turmoil," recalls his mother, Cynthia. "He wanted everybody to be happy, to get along... He'd say 'Life's too short to sweat the small stuff.'" As family members gathered last week in their lakefront home 30 miles north of Detroit, they lined the walls and windows with photo collages that tell Raymond Plouhar's life in chapters. There's the grinning kid with the protruding ears (a coach once joked he looked like a Volkswagen with the doors open) proudly holding up the bass he caught. There's the sturdy athlete grappling with an opponent around a wrestling circle and posing in the green-and-white football uniform of the Lake Orion Dragons. There's the young man in love, sitting with high school sweetheart, Leigha, on his dad's Harley on their way to the prom, then years later, together again, he in Marine blue, she in white, on their wedding day. Then there's the tough-minded Marine in helmet and combat gear — doling out candy from a plastic bag two months ago to schoolchildren in Iraq. "He admired the Iraqi people," his father says. "He said, 'Dad, even though I can't understand a word they're saying, if we were back home... we'd be buddies.'" Plouhar was killed on June 26 by a roadside bomb in Anbar province in his second tour of duty in Iraq, weeks before he was to return home. He was assigned to the 3rd Battalion, 5th Marine Regiment, 1st Marine Division, I Marine Expeditionary Force in Camp Pendleton, Calif.
Plouhar's family says he had no qualms about returning to Iraq and he believed conditions had improved since his first tour in 2005. "I never worried," Leigha says, "because... in my head, he was indestructible and nothing could ever happen to him because he was so good at what he did." His mother says her son preferred to be at the center of the action. In an undated entry in a blog on MySpace.com, Plouhar said "you can call me crazy" but he liked being in Iraq. "Someone has to do it plus I love what I do," he wrote. Plouhar did step back from active duty for four years and worked as a recruiter in Flint so he could donate a kidney to his uncle. It was as a recruiter that Plouhar was seen in Moore's award-winning "Fahrenheit 9/11." The segment shows Plouhar and another Marine in a mall parking lot in a depressed suburb of Flint; it suggests the two men were cynically hunting for poor teens to sign up, rather than go to a wealthy suburb where they'd likely be rejected. "He cried when he found out what it really was," his father says. "He never dreamed that it was going to be something to slam the country, which he dearly loved." The movie, to be precise, is primarily a criticism of the Bush administration's actions after the Sept. 11 terrorist attacks. And yet, the elder Plouhar also says he doesn't see anything wrong with his son's actions. "If you really watched just the part with my son in it," he asks, "how could you not say that he was standing tall and proud?" "'You know what? I know what I do is good for this country and every one of those people I'm recruiting — those guys are my brothers.'" In the past month, the bloodshed that has become part of the daily life in Iraq seemed to edge closer and closer. He was shaken up in two explosions. Two weeks before he died, his mother says, he called and she could hear the strain in his voice. But he tried to be reassuring. "He said, I'll be all right. I don't have much longer... I'm ready to come home. I'm ready." And yet he seemed prepared for the possibility he wouldn't. In a poem he sent to his family last year — a poem now enlarged to floor-to-ceiling size, and covering a wall of the Plouhar home — Plouhar said he knew he could die serving his country and was ready to make the sacrifice. "I will leave my loved ones, my kids, my wife...," he wrote. "Do not feel pity for me, for this is my choice... This is me. This is who I am. 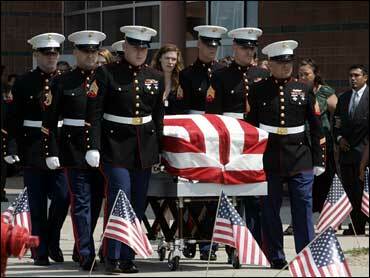 I am a Marine to the very end."